The new office car park. There has been much mention of the proposed new age for the state funded pension. I believe 67 is the magic number .. for now. I have little doubt, however, that it will continue to increase along with our own rate of longevity. I wouldn’t be in the least bit surprised if my Lifeforms will eventually be required to work well into their 70s and beyond. From an economic perspective it shouldn’t really come as too much of a shock. With a growing population living nearly twice as long as the age the economic model was formulated on, something had to give. Science, drug companies and advances in modern medicine have become like surrogate fountains of youth but if we are all to benefit from these near death defying potions and procedures it seems we must be prepared to pay with at least a pound of our extended life flesh. Many may dwell on what this means for them personally, I, meanwhile, have been giving great thought to what it means for the cities and workplaces of the future. Today we worry about the earthquake strengthening of buildings. Now you can probably add to that the widening of halls and corridors, to allow safe foot traffic without hindering Zimmer frames, wheelchairs and mobility scooters. 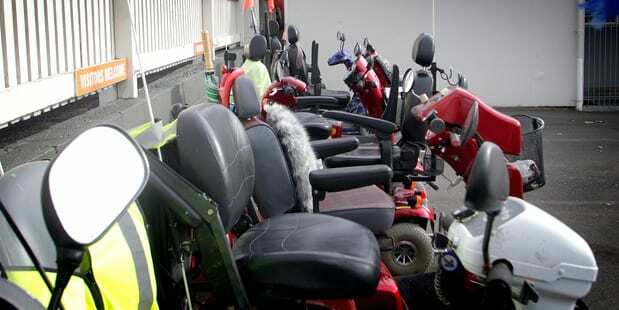 Footpaths too may have to be altered to cater for the increase in such mobility devices. Food outlets will have to look seriously at providing not just drive-thrus but ride-thrus, which in my opinion are long overdue as it is. Hip and trendy employee focused businesses like Google will no doubt go the extra mile by providing in house passing lanes and rest stops in hallways. Their cafe menus will generously include tripe and onion smoothies, steak and kidney linguine, prune and tapioca cheesecake and false teeth friendly vending machines. Elderly employees can elect to participate in weekly “corporate colonic cleanses” and “personalise your incontinence pants workshops”. Others may prefer to sign up to the Sherry Sipping Circle or partake in the bi-monthly Peggy Square Parties. Dentures will no doubt be whisked away during mandated afternoon naps for a deep cleaning treatment and adjusted for gum shrinkage as and when required. The water cooler won’t be the only social meeting point in the office. You can catch up on all the gossip at a “Go with the Flow” station as you meet with co-workers to empty your catheter bags. Extra measures could well include high tech carbon dating techniques for proof of age and smart e-wear uniforms with customised, inflatable airbags, strategically placed to minimise hip and knee damage in the unfortunate event of a fall. Comfortable corporate buses will be laid on for the carless and will always take the scenic route, giving you time to enjoy your shandy. Such employees will be the envy of the elderly. All other fossils, wrinklies and crones, lumbered with less generous and sympathetic employers, will have to suffice with a few added handrails, the occasional raised loo seat and some non slip lino until workplace health and safety plays catch-up, making more suitable measures mandatory. Working for longer may appear to be the obvious answer but accommodating it brings with it so many added costs of its own. You can’t help but wonder if we will just be getting ourselves into an even bigger financial fiasco than we are already in. I suppose it’s human nature to cling to life for as long as we possibly can but is working our fingers to their 80 year old bones really the most cost effective way to realise our ever shortening retirement dream?